Was it inevitable? A Mac fan in Germany has put together a 2013 Mac Pro clone that is housed inside — could this be more natural — an actual trashcan. While imitation is said to be the highest form of flattery, Jony Ive and his design team probably are not be feeling the love. Nevertheless, this DIY Hackintosh trashcan is brilliant! Lots of people talk Hackintosh, but the folks who frequent and post on tonymacx86 walk the walk — think different, really different. 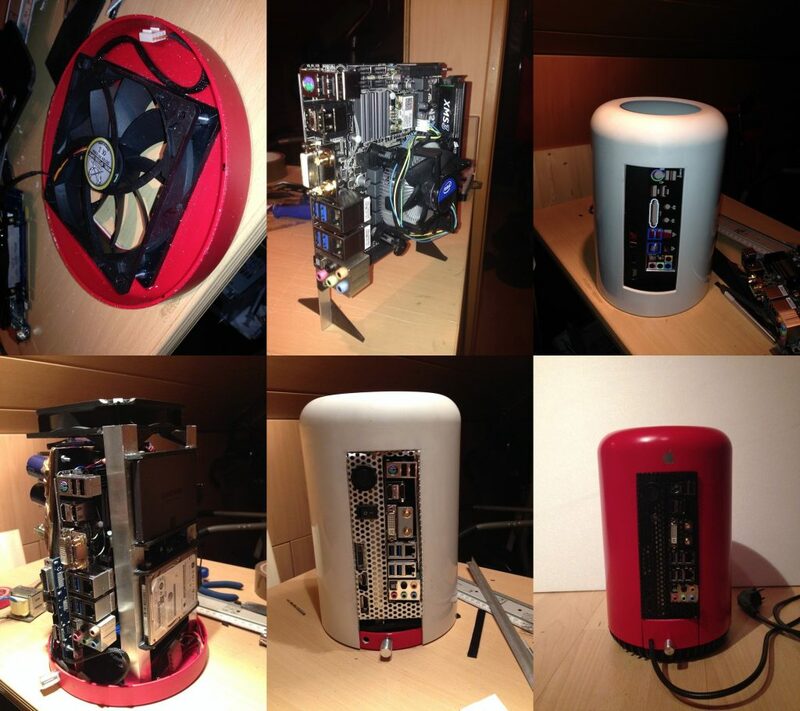 That said, you have to see Mac Pro (late 2013) replica, a DIY Hackintosh built inside a modded trashcan. Apple’s 2013 Mac Pro measures 6.6 x 9.9 inches, so the size is about right. The specs of this 2013 Mac Pro Clone, however, are a bit underwhelming. Quite usable for daily computing tasks, but not the stuff of a real 12-Core Mac Pro. Still, if you wanted Jony Ive’s $977,000 Product Red Mac Pro, but have a (light) beer budget, this is what you could afford. A coat of shiny, metallic red paint might be more appropriate. And, yes, the 2013 Mac Pro clone features a bottom up airflow design, though not as sophisticated as Apple’s. The unnamed German Mac fan has put a lot of hand-tooled, custom effort and love into creating his paean to Jony Ive’s desktop Mac masterpiece. That said, now that someone’s done the “Hackintosh trashcan” concept, I expect more people will give it a try, as well. 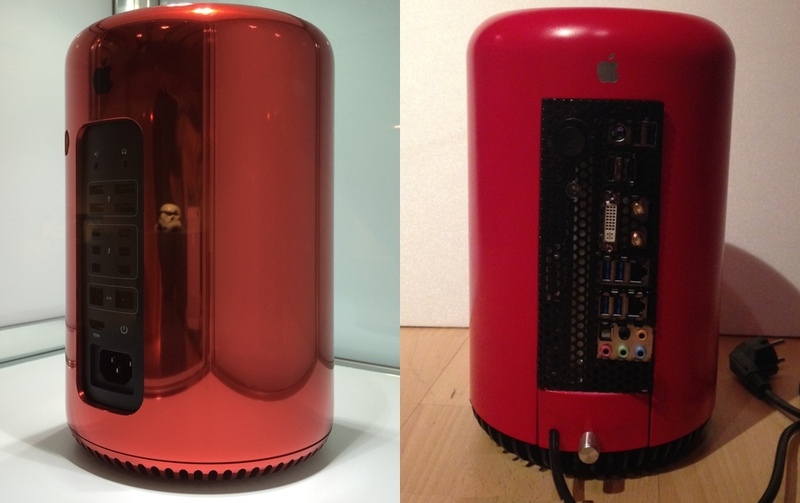 So, what’s your take — Is the 2013 Mac Pro clone simply too cheesy to take seriously? Have you seen a trashcan or similar cylinder that would make a great 2013 Mac Pro clone?